British Columbia is exploring ways to clean up a long-defunct metals mine about 40 miles northeast of Juneau. The Tulsequah Chief Mine has been polluting the transboundary watershed for decades. Toronto-based Chieftain Metals took over the mine in 2010. It was the latest in a string of efforts to restart gold, silver, lead and zinc mining near the confluence of the Tulsequah and Taku rivers. The Canadian mine was developed in the early 20th century. But it was abandoned in 1957. John Morris Sr. recalls commercial salmon fishing on the Taku River from the 1940s when people in Southeast Alaska began to speculate about the mine upstream impacting the fish. 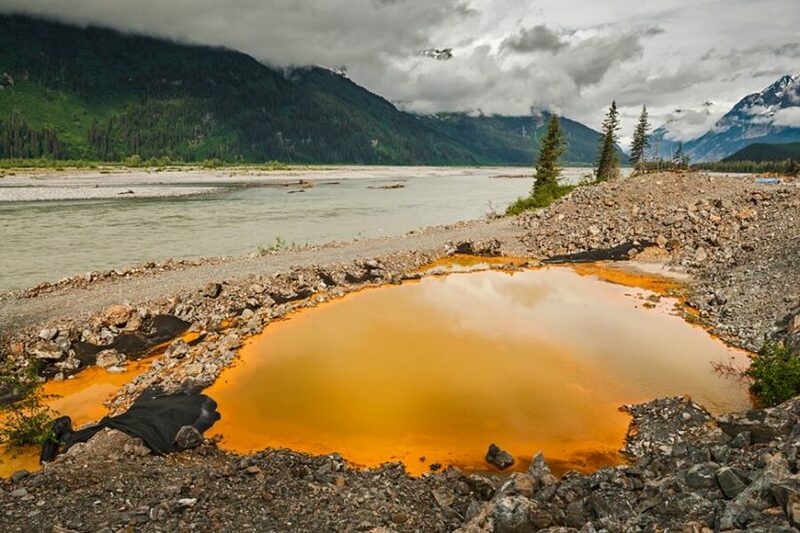 “It was later on like in 1956 or 1957, I think, that somebody finally said, ‘If you go up to the Tulsequah Chief Mine you’re going to see that holding pond that’s real orange, and there’s a pipe leading out and it’s leaching right into the river,’” Morris said. Morris is the vice president of the Douglas Indian Association, a federally-recognized tribe in Juneau that’s been working to get the mine site cleaned up for decades. Tlingit elders on the other side of the border have been doing the same. He’s referring to a water treatment plant installed by Chieftain Metals. It operated for nine months but didn’t work and was shut down in 2012. “Just because it didn’t work doesn’t mean that the pollution stopped. It still continues,” Ward said. Chieftain Metals then ran into serious financial trouble. Losses were reported in the hundreds of millions for creditors and investors and the company went bankrupt in 2016. It then missed several key deadlines set by British Columbia regulators to address pollution concerns. Its main creditor, West Face Capital, has since taken charge of the site. Earlier this month, British Columbia’s ministry responsible for mining put a 15-page request for proposals for a private contractor to clean up the site for good. “They are making some moves now, so that’s good news,” Ward said. Environmental groups have also welcomed British Columbia’s apparent step toward reclamation. “I think B.C. is now thinking, ‘To do the right thing, to get this monkey off our back, I think to show that we’re a good neighbor, we’ve got to clean it up,’” said Chris Zimmer of Rivers Without Borders in Juneau. His group will be watching closely to ensure the remediation is comprehensive. The mine’s legacy left mineral sulfides exposed to air and water that’s been generating acidic runoff for decades. Gov. Bill Walker wrote to his counterpart in British Columbia on Oct. 31 urging the premier to order the mine’s full reclamation. British Columbia’s Ministry of Energy, Mines and Petroleum Resources released a statement Wednesday confirming that Chieftain Metals is in compliance with mining laws and regulations. “The province remains committed to resolving the ongoing contamination and remediation concerns at the site, and holding all owners, both past and present accountable for remediation and reclamation,” the statement said. The deadline for proposals is Nov. 29. A remediation plan wouldn’t be submitted until late 2019, meaning work wouldn’t actually start until 2020 at the earliest.